It's animal print overload in today's throwback outfit. Ha ha. Snakeskin on my sweater and jeans plus leopard print on my shoes. Luckily the jeans are subtle so the total look isn't insanity. I am so on board for this - I love mixing animal prints! I would have never noticed three animal prints at first glance, and they all work together beautifully. This is a combo I'll have to try (though I'll probably only have one animal print). Throwback outfit! That's a great idea! 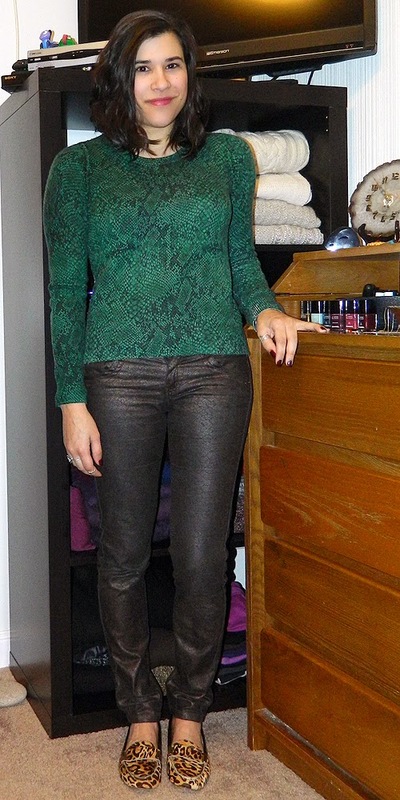 I had a very similar pair of coated/ snake print jeans a few years ago. I've sold them at a flea market since then because they didn't fit any more. But I still like pants like that! I would also still wear the shoes! Love them! You're right the jeans are an awesome way to add in a third print without making too much of a statement. I want to get more printed jeans now, haha!